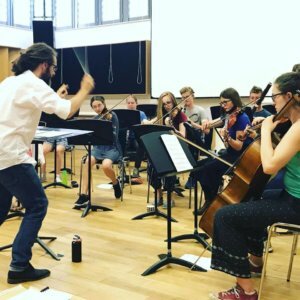 Britten Sinfonia Academy have been working with composer Tom Coult this year, and will perform a new arrangement by him in lunchtime concerts next week. We caught up with him to find out how the year has been. This year, I’ve been working with the fantastic Britten Sinfonia Academy – a collection of talented school-age musicians working with and learning from the professional musicians of the Britten Sinfonia. Their final performances are coming up this week in Norwich, Cambridge and Suffolk’s Latitude Festival, including my orchestrations of Schumann’s Studies in Canonic Form. 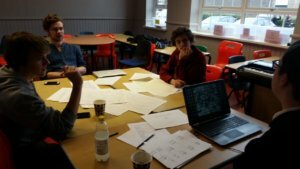 I’ve been the composition mentor for the four young composers on the Composer Hub scheme over the course of the year – Jasper Eaglesfield, Morgan Overton, Ben Pease Barton and Alexia Sloane. They’ve each written two pieces for their peers – the first performed by Academy players at Cambridge’s Fitzwilliam Museum, and the second professionally recorded at Anglia Ruskin University, with fantastic conductors William Cole and Darren Bloom. One of the nicest things was how completely different every composer’s voice has been from one another – I can barely imagine four more distinct and contrasting pieces as the ones recorded at the end of the year. It’s hugely encouraging and impressive to see four composers with such clear visions of how they want their music to behave. Schumann’s Studies in Canonic Form were written for the ‘pedal’ piano – an adaptation of a piano with bass notes played by the feet, allowing players to practice the organ in a domestic setting. There aren’t many of these around nowadays, and the piece is most often played in the version for two pianos prepared by Debussy. The six movements show great contrapuntal skill and canonic technique, but don’t be fooled by the dry-sounding title – this is music of great wit, charm, beauty and elegance. I can feel Schumann enjoying himself in this music – compared to some of his other demonstrations of contrapuntal technique, this feels like music with a smile always on its face. I sometimes think of the process of orchestration as being like taking a set of paintbrushes to a line drawing in ink – the shapes and contours are there, but your job is to provide colour. To bring something to life in unexpected ways and to pour one’s own musical personality into a beautifully-made frame. I had enormous fun ‘colouring these pieces in’ – turning a blueprint into a kaleidoscope. I was also delighted to be asked to suggest pieces to be performed alongside my Schumann orchestrations – listeners will also hear two of my desert island pieces, Webern’s orchestration of Bach’s Ricercar a 6 and Ravel’s Mother Goose Suite. All the pieces then, are orchestrations and arrangements of earlier keyboard works (Webern’s of Bach’s, mine of Schumann’s, and Ravel’s of his own earlier version for piano duet). I like that as the young BSA composers have been learning about orchestration this year, we end with concerts that focus on this craft of colour. We end in the world of sound – sensuous, textured, and intoxicating – the reason why all musicians get out of bed in the morning. The concerts will be at Norwich’s St Andrew’s Hall and Cambridge’s Mumford Theatre, then a fun final date on the BBC Music & Film Arena at the Latitude Festival (because obviously a music festival is barely worth the name without some orchestrations of 19th-century exercises in counterpoint…). Britten Sinfonia Academy will perform Tom’s new work on 12 and 13 July in Norwich and Cambridge. Find out more and book your tickets here.